I thought I’d share a little about some of the products in my current skincare routine, which are from one of my favourite brands: Biotherm! 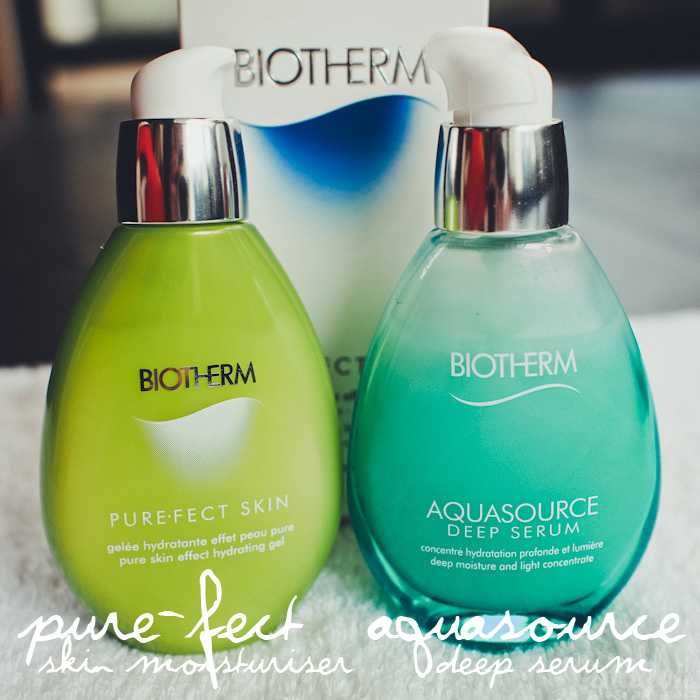 My first experiece with Biotherm‘s famed Aquasource was more than two years ago, with the Aquasource Deep Hydration Moisturiser! I loved it upon first usage, with its powerful hydrating properties as well as light gel texture which absorbs extremely well! Aquasource is Biotherm’s no.1 best-selling hydration range, and after 15 years of history, Biotherm is now launching Aquasource‘s most powerful serum yet: the Aquasource Deep Serum! 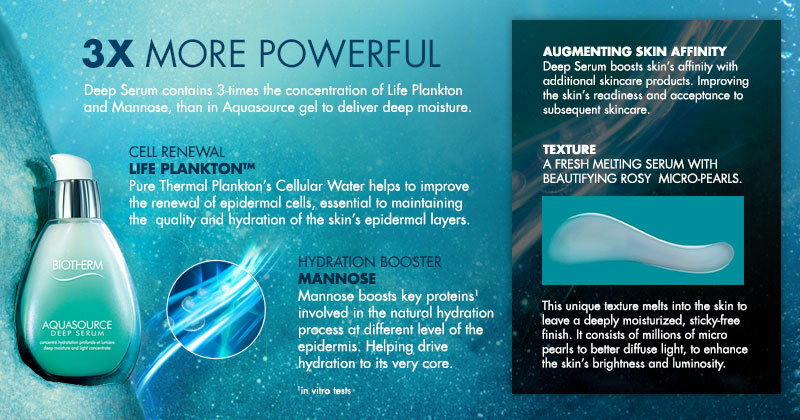 Aquasource Deep Serum‘s next-generation formula captures 3–times the concentrations of Aquasource’s regenerating Life Plankton™ and ultra-moisturizing Mannose to deliver deep hydration so skin looks radiant, re-plumped and regenerated! 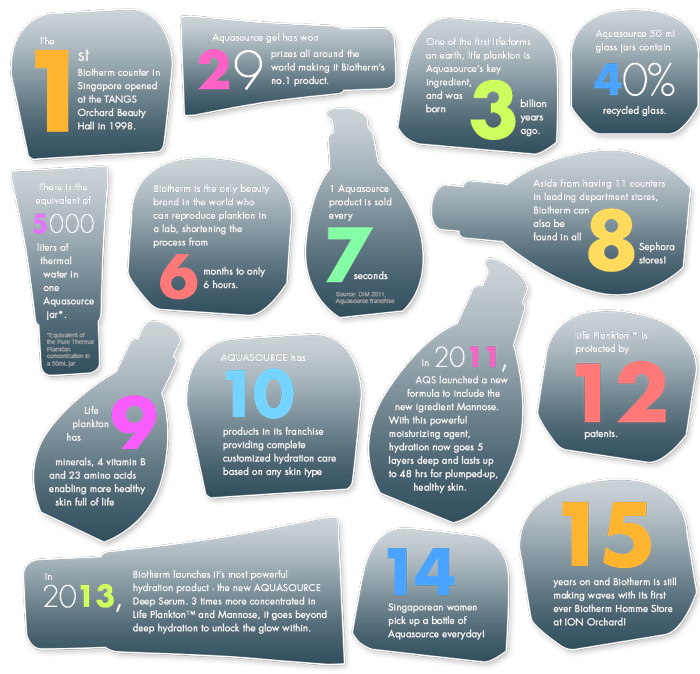 What I really love about Biotherm is its approach towards creating effective skincare products that really work. All Biotherm products contain thermal plankton, a micro-organism found in the hot springs of the Pyrenees Mountains. The average body is made up of about 60% of water, and this is the reason why Biotherm has delved into the waters of the earth, in order to find substances that have the closest affinity to our skin, and they discovered thermal plankton, which has a similar structure as certain skin cells! This affinity of thermal plankton allows our skin to effectively absorb its nutrients and goodness, such as its unequaled healing properties to regenerate, repair and soothe, enhancing skin quality to leave the complexion soft, smooth and glowing! 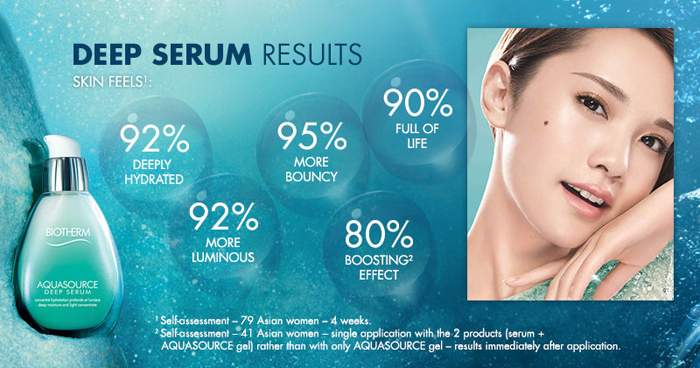 Back to Aquasource Deep Serum. It contains THREE TIMES the concentration of Life Thermal Plankton and Mannose as compared to Aquasource gel, in order to deliver deep moisture to dehydrated skin! Mannose, a simple sugar derived from tree pulp helps to deliver hydration and vital protein boosters to all layers of the epidermis, while Life Plankton helps to improve the renewal of epidermal cells, and contains 4 vitamins, 23 amino-acids, and 9 oligo elements. Other than these two key ingredients, Aquasource Deep Serum also contains millions of micro pearls which help to beautify the skin by diffusing light and enhancing the skin’s brightness and luminosity! The texture of Aquasource Deep Serum is pretty amazing. It is extremely light-weight and has a lovely pearly sheen to it, thanks to the illuminating micro pearls! It spreads easily across the skin, and is instantly absorbed, leaving my skin feeling really nice and moist! 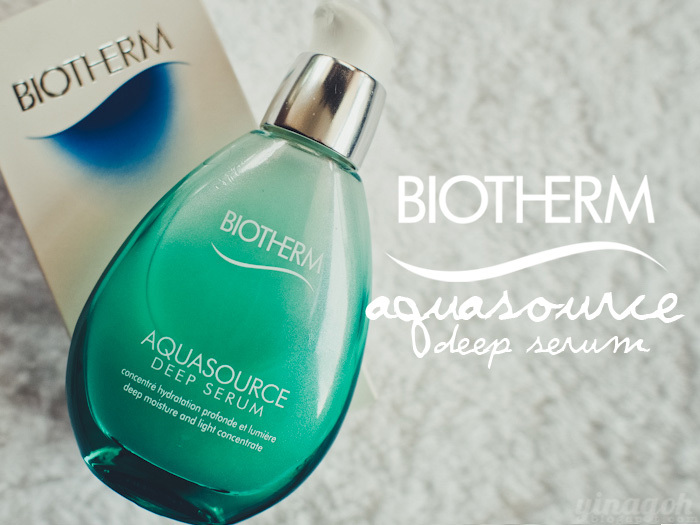 Biotherm Aquasource Deep Serum retails at SGD85 and can be found at all Biotherm counters in Singapore. PS. Don’t say I never share ah! If you’re interested to try out this product, you can actually redeem a 3-day trial on Biotherm’s website! My skin has never been in need of hydration more, because of Roaccutane! ;( I’ve been taking Roaccutane for about three months now, and thankfully I’ve stopped breaking out and my skin is now on the road to recovery! However, Roaccutane has dried out my skin a lot, and thus I’m very grateful for the intense hydration that Aquasource Deep Serum provides. Right after Aquasource Deep Serum, I use Pure.fect Skin Hydrating Gel, which I feel helps to lock in the hydration from Aquasource Deep Serum, while still feeling very light on my skin! I also feel that Deep Serum, while very hydrating, tends to feel slightly sticky after application, and Pure.fect Skin Hydrating Gel helps to remove that stickiness and leaves my skin feeling matte and clean. Can’t wait for tomorrow cos it’s photoshoot day for TheVelvetDolls! 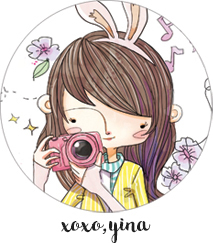 Eggcited to shoot the new collection! ^.^ That’s probably been the best part of 2013 for me, TVD’s shift to our new website! Really love how much more convenient the shopping cart system is, and how professional it looks. Still some bugs here and there, but on the whole it’s been so much better on the new website!